CORVALLIS — Since Pat Casey's program rose to prominence in the mid-2000s, Oregon State has run out a succession of outstanding catchers. Mitch Canham, Andrew Susac, Ryan Ortiz, Jake Rodriguez and Logan Ice all made all-Pac-12 and all-Regional teams through a 12-year period ending in 2016. Adley Rutschman, the incumbent, is next in line. And he may be the best of the bunch. "That's a great group of catchers," OSU assistant coach Andy Jenkins says. "They paved the way and set a standard that, 'This is Oregon State at the catcher position.' And Adley has fit right in." The 6-2, 215-pound sophomore from Sherwood High was leading the Beavers — ranked between third and sixth in the polls this week — in batting average (.374) going into a three-game series at Washington State, which begins Friday. The switch-hitting Rutschman has 13 doubles, three triples, four homers, 42 RBIs and a team-best .466 on-base percentage in 39 games. Add that to his arm and defensive work at catcher and masterful handling of the pitching staff, and it's a rare combination in college baseball. "I wouldn't trade Adley for another catcher in the country," says coach Pat Casey, in his 24th year at the OSU helm. "He has made big steps offensively and has continued do to a great job with the pitching staff. He is one of the best players we've had in this program. Everything you can imagine from a player, he gives you. We knew he was going to be a really good player for us, and he has exceeded that." Rutschman's performance at the plate is a far cry from his freshman season, when he hit .234 with seven doubles, one triple, two homers and 34 RBIs in 61 games. After batting .157 in 70 at-bats with the Falmouth Commodores in the Cape Cod Summer League, it was easy to conclude he was simply worn out after a long, arduous year of baseball. Not the case, Rutschman says, who was making some technical adjustments at the plate as well as going through the growing pains of a freshman year at the top amateur level. "Hitting is a very complex thing," he says. "It is process-oriented. You have to stick with it. I was trying to make big adjustments with my swing, and it's hard to make those in-season. You're just not going to see the results like you want to right away. "I really didn't see the results of it until winter. It was like an eight-month adjustment. This season, I'm seeing those results." Rutschman says he has also benefited from work with his coaches at Oregon State and at Cape Cod, "along with having the experience of playing a season of college ball." "Coming out of high school, you don't know exactly what to expect," he says. "I did a good job of working hard in the offseason on the things I needed to. It's paying off." Last season, as Oregon State mounted a 56-6 record and reached the final four at the College World Series, Rutschman caught 56 games. In light of his offensive deficiencies, he focused on handling a pitching staff that posted a national-best and school-record 1.93 ERA. "I was absolutely disappointed with my hitting," he says, "but you have to learn to accept some failure in your game. Getting back there behind the plate, you can't take your at-bats with you. "Making sure I understood what our pitchers wanted and how best to serve them in what they needed to do to be most successful was my No. 1 priority." This season, Rutschman has added the hitting piece to provide the whole package, which earned him an invitation to play with the USA Collegiate National Team this summer. "I got invited to a tryout for the national U-18 team between my junior and senior year (at Sherwood)," he says. "I didn't make the team. It's always been a goal of mine to play for Team USA. What more could you ask for than to get to represent your country on a big stage? I feel humbled to have that opportunity. It's going to be a fun experience. I'm looking forward to it." Rutschman has athletic genes. His grandfather, Ad Rutschman, is a legendary football coach who took Linfield to three NAIA national championships in the 1980s. His father, Randy Rutschman, was a standout catcher at Linfield who is considered one of the foremost teachers of the position in the Northwest. "He's the best there is," Adley says of his father's coaching prowess with catchers. "He makes the hard things of catching easy to understand, which is the most difficult thing to do as a coach. My grandpa did that well in football, too — making everything seem so simple in a complex game." Those around Rutschman agree that Randy's impact on his son's catching ability is immense. "Everything Adley has learned fundamentally is due to Randy," says Ad Rutschman, 86, who rarely misses an OSU game at Goss Stadium. "He has worked with Adley since the first day he picked up a baseball." "I've worked a lot of camps with Randy," says Andy Jenkins, OSU's assistant coach who works with catchers. "He taught me some things about catching when I was a player at Mt. Hood (Community College). Besides the fundamentals with Adley, you see the intangibles — the love for the pitcher, being a great teammate — that all came from Randy. It's been a huge advantage having his dad as a great mentor." Randy says he let Adley control his growth as a player. "Adley was self-motivated. I really think it was because he was around the ball field a lot, with me and his grandpa. I'd take him to a game; he didn't want to watch, he wanted to play." The Beavers had an in on the recruiting trail with Rutschman. Randy had been OSU associate head coach Pat Bailey's catcher coach when they won an NCAA Division III championship at George Fox in 2004. "I've known Adley since he was 5," Bailey says. "When Adley was a junior, I told Randy, 'If he doesn't commit to us, I'm going to burn your house down.' Then I said, 'I'm not joking, Randy.' "
Rutschman was a star pitcher and catcher at Sherwood. He was also a standout football player who kicked a state-record 63-yard field goal as a senior. Gary Andersen asked him to come out for football as a freshman, and Rutschman wound up kicking off for the Beavers in 2016. He gave up the gridiron to concentrate on baseball full-time this year. 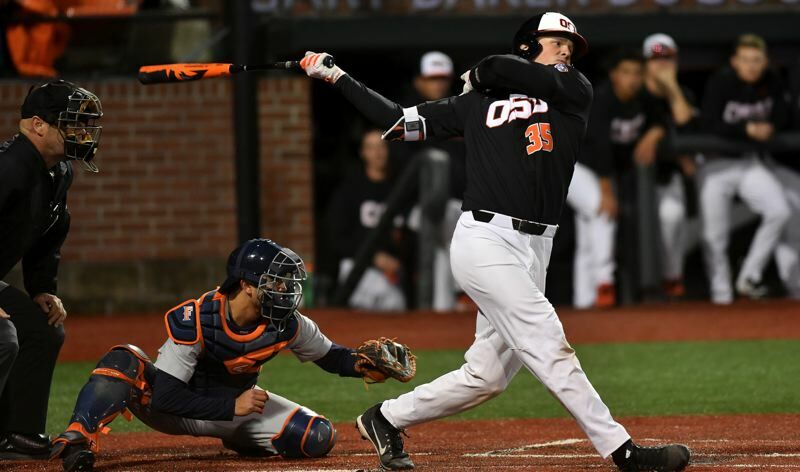 As a freshman, OSU baseball coaches projected Rutschman as the heir apparent to Ice, who had signed pro following a junior year in which he earned the Pac-12 Defensive Player of the Year Award. "When you look at the athletic ability, how quick his feet are and the arm strength — I was sold from the first time I saw Adley catch," Jenkins says. "I thought he'd be our starter right away as a freshman." Rutschman has improved dramatically during his season and a half with the Beavers, especially at the offensive end. "He is determined," Casey says. "He has a desire to be good. He's a worker. He wants it. And the best thing about it is, he is a team guy. He puts winning ahead of himself." Rutschman has a season and a half to go before he starts thinking about his pro career, but he is going to get a chance. Canham, who was a first-round pick in 2007, made it only to Triple-A. Susac, a second-round selection in 2011, has played 124 games in the major leagues for San Francisco and Milwaukee. Ortiz, a sixth-round choice in 2009, made it as far as Triple-A. Rodriguez, taken in the 19th round in 2013, played only Single-A ball. Ice, a second-round pick in 2016, is playing for Lynchburg, Virginia, at the Class A Advanced level in his second full season of pro ball. Those in the OSU program believe Rutschman has the best chance of any to succeed at the major-league level. Pitching coach Nate Yeskie played professionally with Hillsboro native Ben Petrick, who played five seasons in the majors before Parkinson's disease cut short his career at age 26. "Adley's athleticism reminds me of Ben's," Yeskie says. "Adley is like a bigger Craig Biggio. He's an athletic freak behind the dish. Nobody has a better arm. He and Andrew were on a par for pure arm strength." Yeskie watches a good deal of major-college baseball on television. "Adley's ability to field bunts and pop-ups? There's nobody in the country at his level," Yeskie says. Rodriguez says Rutschman reminds him most of Ice. "They're both switch-hitters, and both of them played right away on successful teams," says Rodriguez, now director of operations for the Beavers. "Adley didn't have a great freshman year at the plate, but he is having an unbelievable sophomore year. Defensively, he hasn't skipped a beat since he walked in the door. "He's a super competitive kid. He knows the game of baseball. Just like (second baseman) Nick Madrigral, he knows everything he needs to do out there. He understands the little things a lot of guys don't pick up until later in their careers. He is very mature in that sense." "Adley has the opportunity to be a first-round pick," Bailey says. "It's not just the catching tools. He's a switch-hitter with some power. Scouts are going to find out, too, that he's an amazing, very humble young man, well-grounded with a great family." "He'll be a top draft pick," Jenkins agrees. "When you think about the package — the arm, the bat, switch-hitting, the intangibles — he's right at the top with some really great players we've had a catcher. He has a chance to play for a long time in the big leagues." OSU coaches say Rutschman still has strides to make, however. "There's a type of makeup you have to have as an Oregon State catcher," Jenkins says. "All the guys we've had turned out to be great leaders. That's Adley's next step for next year. We'll be losing some leadership. Rather than doing it by example and just being a stud, he needs to start bringing people with him and being more vocal and a guy (teammates) look to." "The intricacies of the game is where Adley has to continue to close the gap," Yeskie says. "You have to learn to be every (pitcher's) guard dog as well as policeman. You're their best friend one inning, and next inning you have to find a way to motivate them. It's the closest thing to a quarterback on the field. Adley has done a good job with all that, but he's still getting there." Rutschman wants to get better individually, but there is more important collective aspiration. "Our goal is to win the national championship," he says. "It always has been. With the amount of veteran guys we have this season and how they're helping out the younger guys, we're going to continue to progress. "We haven't reached our potential as a team. When we come together, I'm hoping it's going to be really special."